Why would I talk about a horror film like Scream 4 in January? Isn’t that more of an October thing? Well, it’s a new year with new rules. I’m not a huge fan of the horror genre. I enjoy Alien, Halloween (1978), Psycho, and a few other horror films, but they are generally not my favorite kind of thing to watch. But I love the Scream films. The fact that they are brimming with intelligence and well-crafted suspense puts them in a different category from the usual “blood and guts” affairs. I enjoyed the first two Scream films, but the third one let me down. That’s true of a lot of film series: Superman III, X-Men: The Last Stand, Spider-Man 3, etc. Anyway, Kevin Williamson, the writer of the first two Scream films, didn’t write Scream 3, which is definitely why it suffered from so many problems that the first two managed to avoid. Williamson returned to pen the fourth film in 2011, long after I had stopped thinking about the series. I finally gave Scream 4 a shot a few weeks ago, and I was shocked by how much I liked it. Right off the bat, we’re in familiar territory with a pair of pretty young women getting a call from a creepy-voiced killer. But nothing is as it seems. The movie fakes us out twice and gives us a total of three opening scenes. This combination of the familiar and the unexpected is what makes this movie so good. It doesn’t discard the formula the first two films worked so hard to set up and exploit, but it gives us a new perspective on it. Scream 4 toys with the audience’s expectations and even with the expectation that we will have expectations. I especially like the backwards-camera scene. In the first Scream, a side character watches a scene from Halloween and tries to warn the main character to look behind her even as he himself is stalked by a killer right behind him. 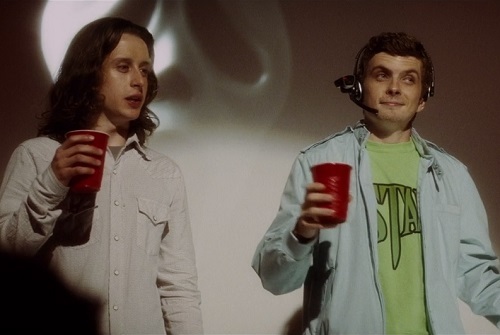 In Scream 4, a character accidentally puts on a video headset backwards and we are just waiting for the killer to pop up behind him so he’ll see his death coming but not be able to defend himself. But when his death does come, it still finds a way to take us by surprise. The filmmakers knew we would think we were one step ahead, so they went one step beyond. Scream 4 picks up the pieces surprisingly well for a film with an 11-year gap since the previous installment. Nowhere does it do this better than with lovable old Dewey Riley. Dewey was a deputy sheriff and the older brother of main character Sidney Prescott’s best friend in the first film. Then he was demoted to being basically a civilian in the next two films. 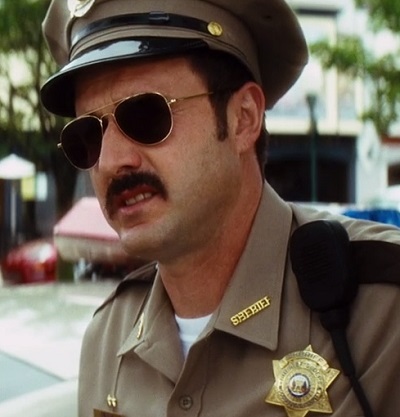 But in Scream 4 he has become the sheriff of the small town of Woodsboro, where the first film took place. And he’s happily married to his on-again, off-again flame from the earlier films, Gale Weathers. It makes me so happy to see Dewey find lasting joy because, of all the characters from the original film, I think he deserves it the most. He’s just such a good guy, always doing the right thing and acting courageously. The fact that Dewey is the first core character we see in Scream 4 bodes well for the film, and it continues to make good on its promising start. I love the scene where a bunch of horror-movie enthusiasts get together for a Stab-a-thon in honor of the fictional film series inspired by the events of the Scream films. It includes a recreation of the opening scene from the first Scream. It’s also a recreation of the opening scene of Scream 2, complete with someone being attacked by Ghostface as the film is playing. Plus, it’s a commentary on the legacy of the Scream franchise because the people watching Stab are reciting lines and anticipating jump scenes, just like the characters in Scream did with the original Halloween. Basically, this scene encapsulates what the Scream series does at its best: It generates some memorable scares by being smart and inventive. The Scream films work so well because they give us something new each time. The first Scream surprised us by having two killers instead of the usual one. Scream 2 shockingly killed off an important character at a moment when no one expected it, making it appear that no one was safe heading into the climax. 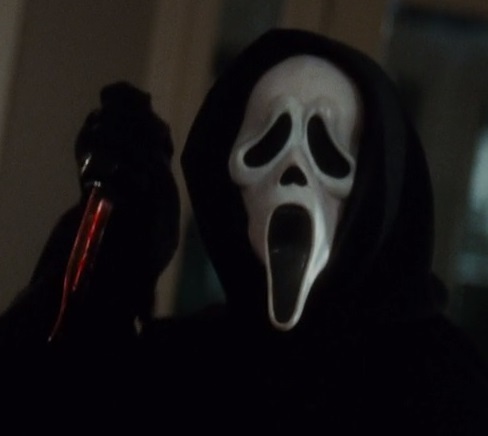 Scream 4 gives us another great twist by delving into the psychology of the victim. We’re used to a certain type of character being the sole survivor of a horror film: Ripley in Alien, Laurie in Halloween, Nancy in A Nightmare on Elm Street, and so forth. But what if someone was so desperate for attention that they would become a killer in order to make themselves look like a victim? This film answers that question. And the ending lets us have our cake and eat it, too, by killing off characters and then bringing them back while also painting the villain as a hero just before the truth comes out about them. Scream 4 came out in a post-Saw and Paranormal Activity world. Moviegoers weren’t exactly pining for a return to good old-fashioned scary movies the way they were in 1996 when the first Scream debuted. And it showed in its diminished box-office returns compared to the earlier films in the series. This entry was posted in Pleasant Surprises and tagged films, horror, movie review, movies, relationships, scary movies, scream, sequels, wes craven. Bookmark the permalink. If you liked “Scream 4” you’ll love “Nightmare on Elm Street 7” . It’s exactly the same proposition! (Kevin Williamson wrote the both movies). That’s right – New Nightmare. I can’t believe it’s been more than 20 years since that came out in theaters. Unfortunately, I liked the idea of it more than the execution. It’s probably not the fault of the film, but simply that I was never a big fan of Freddy Kreuger.